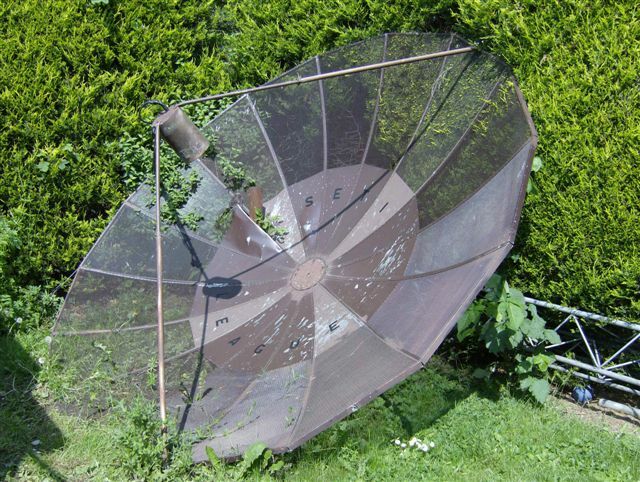 In August 2008 came the offering of a 3.15m dish originally used for SETI for free collection so i jumped at the chance as it was only a few miles down the road in Stockton! A hole was cut into one of the panels for the fibreglass feed pole and some modification was done to the original polar mount to make it good for my EME setup. An old scrap trailer was aquired for nothing which was not what i was loking for but it has got my setup up and running, the trailer sides were cut off in a few minutes to leave a flat base to start work installing the mount. The mount is very simple, it is just a 3" bearing mounted on a plate which is on the top of four pieces of box section, the 3" tube from the dish mount slides through the bearing and down into the worm drive coupling made up at the base. Here are a few photos... Not finished, Still not finished in June 2012!! My first time QRV was 16th August and i heard RD3DA calling CQ but did not get back in time to call him on JT65, i managed a easy QSO with Howard G4CCH and also one with Serge UT5JCW to my surprise when he came back to my calls and was also quite easy JT65 contact. After everyone went QRT i thought i would try to hear my own echoes, maybe being a little optimistic! RX: G4DDK LNA radio is Yaesu FT-736r. maybe some matching problem between the feed and LNA? Also heard DL0SHF in SSB! Yes i know he runs a big station but very nice to hear good SSB signals via the moon for the first time! !